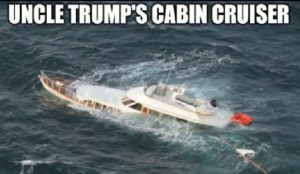 What does Uncle Trump’s cabin cruiser look like? Is the payoff worth it? Will he be the ‘foreclosure’ President? “Flotsam” is the stuff you see floating away as the boat sinks. “Jetsam” is the stuff the captain tossed overboard – like the GM bond-holders – hoping to keep it all afloat. PreviousPrevious post:Who is the 25%?NextNext post:What’s the dumbest philosophical mistake? What purpose do humans serve here on Earth? How do I know you’re not the one projecting? What’s the dumbest philosophical mistake? Would you rather see a foreign art film, or a whore and fart film? What is a Gumption Trap, how can I tell when I’m in one, and how do I get out?